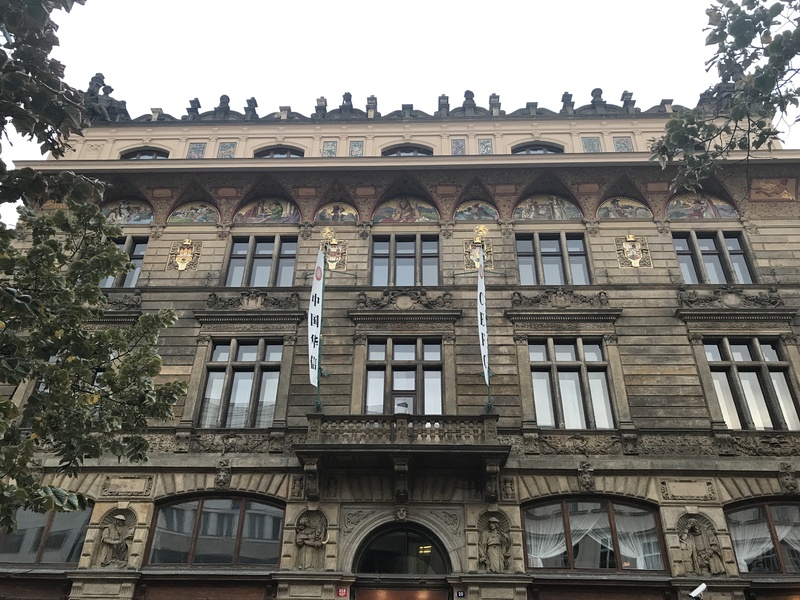 Prague (part 2: a cold in the cold) – record of m.
I had thought I would feel better after the previous night’s food tour. Wrong. I woke up feeling awful, with a lingering sore throat and an added “head feels like it weighs a hundred pounds.” After breakfast as late as we could go, I went back to bed and basically slept until about 3pm. Virginia was awesome and waited for me, and thankfully I felt a lot better after several hours of sleep. We finally left the hotel and took the tram to Old Town. Taking advantage of the Taste of Prague guide book, we decided on a late lunch at Sisters, having an open-faced sandwich and coffee. At the time, it was just enough food to keep going, so we walked over to the Convent of St. Agnes (accessible via Prague Card) and looked at an extremely focused collection of medieval art focused on Christ and the Madonna. While interesting, it can be a little overwhelming and repetitive, so we finished walking through and left. Next stop: Onesip Coffee and a great double espresso. We took our drinks outside to a bench opposite La Degustation to figure out what we could do next. We realized we were hungry again, so we went to Nase Maso, the butcher shop from the tour. I ordered a burger (sadly, the dry-aged version was long gone), Virginia got a meatloaf sandwich, and we had small glasses of wine. A table opened up just as I paid and we soon had our food and drink. Honestly, I could eat there every day — it was delicious and inexpensive (under $20 for everything), and everyone behind the counter was really nice. From there, we walked along Revolucni and then on Na Prikope back toward our home base. We stopped in Hamley’s Toy Store on Na Prikope, finding much that was familiar: Star Wars, Lego, Melissa & Doug, etc. After leaving Hamley’s, we walked to Wenceslas Square back into New Town. Before retiring for the night, we stopped at IF Cafe (which we’d walked past a few times already). I had a pistachio cream cake and flat white, and Virginia enjoyed a chocolate/raspberry/vanilla cake and red wine. And then to bed to try and shake this cold. Unfortunately, that was not to be. I woke up still unwell, though not nearly as bad as the previous day. We slept in and then returned to IF Cafe for breakfast (a ham/cheese omelette for Virginia, and ham and eggs for me, with coffee all around). Feeling fortified, we took the tram up to Malostranska, the closest stop to Prague Castle. Prague Castle itself is a walled complex, with palaces, churches, and homes. It’s also the current residence of the President of Czechia, so much of it is devoted to government. From outside, St. Vitus’ Cathedral is the most prominent landmark, but there’s a number of places to go. Our Prague Card got us into St. Vitus’, the Old Royal Palace, and the Golden Lane. The last is a series of cottages that housed the people who worked in the castle. Franz Kafka also lived there for a year during World War I. A colorful row along the way. By the time we left, it was time for a coffee break. The Taste of Prague book guided us to Super Tramp Coffee, a small place tucked away in a nondescript building courtyard. It was perfect for us to rest — great coffee, small snacks, and excellent music from the turntable. We spent maybe 45 minutes there reading and refreshing. That gave us the energy to go to one more place that afternoon. We decided to go way out of our way and walk past the Dancing House building to Vysehrad Fortress, defying the unpleasant weather. Google Maps took us the long way around the back of the hill on which the fortress rests, but we managed to finally reach the gate at the top. We stopped by the rotunda of St. Martin, which dates to the 11th century, and walked past the cemetery and Church of St. Peter and Paul before turning around and heading back to the hotel to rest. The Church of St. Peter and Paul. That night was the first of our two fancy dinners, and the one that mandated more formal attire (i.e. a sportcoat). Alcron is old school — its tiny dining room has a distinctly art deco aesthetic and transports you back into the 1930s. Its food is similarly classic, with just a few peeks of more modern cuisine on the menu. One of the many wines we had. All of this was paired with a variety of wines from all over Europe, and presented by an amazing staff. I also got to spend plenty of time watching the table next to us: two American couples visiting, with one of the two gentlemen ordering the beef fillet three times in a row (it was outstanding, but I prefer more variety). We left completely stuffed and ready to collapse, which we did as soon as we returned to the hotel.